Is WhatsApp really worth the $19 billion price tag? On Wednesday, Facebook acquired messaging app WhatsApp for $19 billion in cash and stock, a number that left many scratching their heads, including “The End of Big” author Nicco Mele. “The valuation is crazy to me,” Mele said in a phone interview to PBS NewsHour. Do you remember the days when $1.6 billion was considered a lot of money? That’s how much Google bought YouTube for back in 2006. In a billion-dollar deal, Facebook purchased the photo-sharing social network Instagram in 2012. In November, messaging app Snapchat rejected Facebook’s $3 billion offer. When did $19 billion become the appropriate amount to purchase a tech application — one that already turned down a $10-billion offer from Google — from a company that employs 55 people and charges its subscribers $1 per year? WhatsApp accomplishes Facebook’s aim to reach international and mobile audiences, Mele said. The company boasts that it has 450 million monthly users and more than 320 million daily active users. And since WhatsApp is an international SMS text messaging application, many of those users are outside of the U.S., a market that Facebook is trying to reach as its growth in the U.S. slows. With Facebook’s help, WhatsApp now has a greater value than half of the companies in the S&P 500 index. “Is it really worth more than Southwest Airlines?” Mele asked. In December, Facebook reported that 945 million monthly active users worldwide access the social network through a mobile device. According to a Pew Research Center report, one-third of those users only use mobile. Investing in mobile applications makes sense for Facebook’s growth and is in keeping with their prior acquirements of mobile applications. But why invest so much money in an application that’s so similar to others? Mele points out that when Google bought YouTube, the video-sharing website was one of a kind. According to Facebook CEO Mark Zuckerberg, it was. Only time will tell if that $19 billion was worth it. 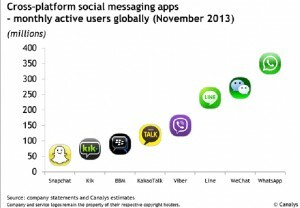 Left: WhatsApp has more monthly users than any other social messaging app. Since November, the popular texting app has more than 450 million monthly active users. Image by Canalys.